*Back Up Warning Sensors*, *Blind Spot Technology - Never Worry When Changing Lanes Again*, *Factory Certified Pre-owned Vehicle! *, *Heated Front Leather Seats*, *Navigation*, *Premium Wheels*, *Rear View Back-Up Camera*, Android Auto, Apple CarPlay, Blind Spot Assist, KEYLESS GO®, Premium Package, SiriusXM Satellite Radio, Smartphone Integration, Smartphone Integration Package. Certified. Odometer is 2745 miles below market average! 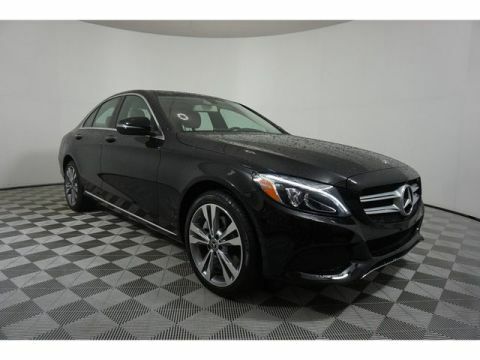 Please reach out: in case we missed a picture or a detail you would like to see of this 2018 C-Class, we are happy to send you A PERSONAL VIDEO walking around the vehicle focusing on the closest details that are important to you. We can send it directly to you via text, email , or Facebook messenger. We look forward to hearing from you! Mercedes-Benz Certified Pre-Owned Details: * 165 Point Inspection * Roadside Assistance * Includes Trip Interruption Reimbursement and 7 days/500 miles Exchange Privilege * Transferable Warranty * Vehicle History * Limited Warranty: 12 Month/Unlimited Mile beginning after new car warranty expires or from certified purchase date * Warranty Deductible: $0 **While we make every effort to verify options; occasionally human error may occur. ** Mercedes-Benz Certified Pre-Owned means you get an additional 12 months Limited Warranty on top of the existing factory warranty, with unlimited mileage. We also do up to a 162-point rigorous inspection/reconditioning, 24/7 roadside assistance, trip-interruption services, and a complete CARFAX vehicle history report. Comes with 12 Month/Unlimited Mile warranty + Trip Interruption Reimbursement and 7 days/500 miles Exchange Privilege*Back Up Warning Sensors*, *Blind Spot Technology - Never Worry When Changing Lanes Again*, *Factory Certified Pre-owned Vehicle! *, *Heated Front Leather Seats*, *Navigation*, *Premium Wheels*, *Rear View Back-Up Camera*, Android Auto, Apple CarPlay, Blind Spot Assist, KEYLESS GO®, Premium Package, SiriusXM Satellite Radio, Smartphone Integration, Smartphone Integration Package. Certified. Odometer is 2745 miles below market average! *Blind Spot Technology - Never Worry When Changing Lanes Again*, *Bluetooth® Hands-Free Calling*, *Heated Front Leather Seats*, *Navigation*, *Premium Wheels*, *Rear View Back-Up Camera*, Android Auto, Apple CarPlay, Blind Spot Assist, KEYLESS GO®, Premium Package, SiriusXM Satellite Radio, Smartphone Integration, Smartphone Integration Package. Certified. Odometer is 1633 miles below market average! 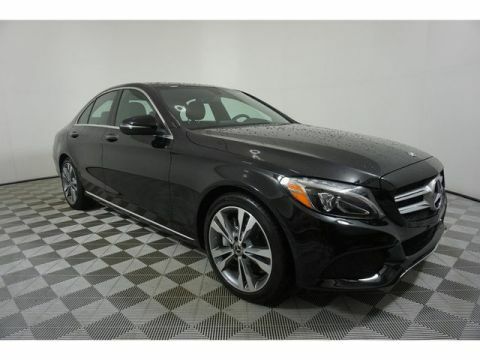 Please reach out: in case we missed a picture or a detail you would like to see of this 2018 C-Class, we are happy to send you A PERSONAL VIDEO walking around the vehicle focusing on the closest details that are important to you. We can send it directly to you via text, email , or Facebook messenger. We look forward to hearing from you! Mercedes-Benz Certified Pre-Owned Details: * Roadside Assistance * Transferable Warranty * Limited Warranty: 12 Month/Unlimited Mile beginning after new car warranty expires or from certified purchase date * 165 Point Inspection * Vehicle History * Warranty Deductible: $0 * Includes Trip Interruption Reimbursement and 7 days/500 miles Exchange Privilege **While we make every effort to verify options; occasionally human error may occur. ** Mercedes-Benz Certified Pre-Owned means you get an additional 12 months Limited Warranty on top of the existing factory warranty, with unlimited mileage. We also do up to a 162-point rigorous inspection/reconditioning, 24/7 roadside assistance, trip-interruption services, and a complete CARFAX vehicle history report. Comes with 12 Month/Unlimited Mile warranty + Trip Interruption Reimbursement and 7 days/500 miles Exchange Privilege*Blind Spot Technology - Never Worry When Changing Lanes Again*, *Bluetooth® Hands-Free Calling*, *Heated Front Leather Seats*, *Navigation*, *Premium Wheels*, *Rear View Back-Up Camera*, Android Auto, Apple CarPlay, Blind Spot Assist, KEYLESS GO®, Premium Package, SiriusXM Satellite Radio, Smartphone Integration, Smartphone Integration Package. Certified. Odometer is 1633 miles below market average! *Back Up Warning Sensors*, *Blind Spot Technology - Never Worry When Changing Lanes Again*, *Bluetooth® Hands-Free Calling*, *Factory Certified Pre-owned Vehicle! *, *Heated Front Leather Seats*, *Moonroof*, *Navigation*, *Power Folding Mirrors*, *Rear View Back-Up Camera*, 4MATIC®, Android Auto, Apple CarPlay, Blind Spot Assist, Electronic Trunk Closer, HANDS-FREE ACCESS, Hands-Free Access Package, HANDS-FREE Comfort Package, KEYLESS GO®, Premium Package, SiriusXM Satellite Radio, Smartphone Integration, Smartphone Integration Package. Certified. Odometer is 7076 miles below market average! Please reach out: in case we missed a picture or a detail you would like to see of this 2018 C-Class, we are happy to send you A PERSONAL VIDEO walking around the vehicle focusing on the closest details that are important to you. We can send it directly to you via text, email , or Facebook messenger. We look forward to hearing from you! Mercedes-Benz Certified Pre-Owned Details: * Transferable Warranty * Includes Trip Interruption Reimbursement and 7 days/500 miles Exchange Privilege * Vehicle History * Roadside Assistance * 165 Point Inspection * Warranty Deductible: $0 * Limited Warranty: 12 Month/Unlimited Mile beginning after new car warranty expires or from certified purchase date **While we make every effort to verify options; occasionally human error may occur. ** Mercedes-Benz Certified Pre-Owned means you get an additional 12 months Limited Warranty on top of the existing factory warranty, with unlimited mileage. We also do up to a 162-point rigorous inspection/reconditioning, 24/7 roadside assistance, trip-interruption services, and a complete CARFAX vehicle history report. Comes with 12 Month/Unlimited Mile warranty + Trip Interruption Reimbursement and 7 days/500 miles Exchange Privilege*Back Up Warning Sensors*, *Blind Spot Technology - Never Worry When Changing Lanes Again*, *Bluetooth® Hands-Free Calling*, *Factory Certified Pre-owned Vehicle! *, *Heated Front Leather Seats*, *Moonroof*, *Navigation*, *Power Folding Mirrors*, *Rear View Back-Up Camera*, 4MATIC®, Android Auto, Apple CarPlay, Blind Spot Assist, Electronic Trunk Closer, HANDS-FREE ACCESS, Hands-Free Access Package, HANDS-FREE Comfort Package, KEYLESS GO®, Premium Package, SiriusXM Satellite Radio, Smartphone Integration, Smartphone Integration Package. Certified. Odometer is 7076 miles below market average! *Back Up Warning Sensors*, *Blind Spot Technology - Never Worry When Changing Lanes Again*, *Bluetooth® Hands-Free Calling*, *Factory Certified Pre-owned Vehicle! *, *Heated Front Leather Seats*, *Moonroof*, *Navigation*, *Panoramic Moonroof*, *Premium Audio*, *Premium Stereo*, *Premium Wheels*, *Rear View Back-Up Camera*, Blind Spot Assist, COMAND® Navigation, COMAND® Single CD/DVD, KEYLESS GO®, Multimedia Package, Navigation Map Updates Included for 3 Years, Premium Package, SiriusXM Satellite Radio, Touchpad. Certified. Odometer is 2747 miles below market average! 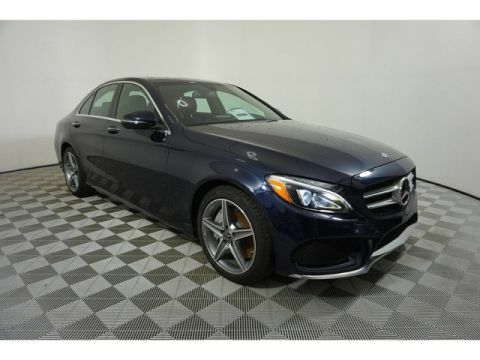 Please reach out: in case we missed a picture or a detail you would like to see of this 2018 C-Class, we are happy to send you A PERSONAL VIDEO walking around the vehicle focusing on the closest details that are important to you. We can send it directly to you via text, email , or Facebook messenger. We look forward to hearing from you! Mercedes-Benz Certified Pre-Owned Details: * Transferable Warranty * Vehicle History * Warranty Deductible: $0 * Roadside Assistance * 165 Point Inspection * Includes Trip Interruption Reimbursement and 7 days/500 miles Exchange Privilege * Limited Warranty: 12 Month/Unlimited Mile beginning after new car warranty expires or from certified purchase date **While we make every effort to verify options; occasionally human error may occur. ** Mercedes-Benz Certified Pre-Owned means you get an additional 12 months Limited Warranty on top of the existing factory warranty, with unlimited mileage. We also do up to a 162-point rigorous inspection/reconditioning, 24/7 roadside assistance, trip-interruption services, and a complete CARFAX vehicle history report. Comes with 12 Month/Unlimited Mile warranty + Trip Interruption Reimbursement and 7 days/500 miles Exchange Privilege*Back Up Warning Sensors*, *Blind Spot Technology - Never Worry When Changing Lanes Again*, *Bluetooth® Hands-Free Calling*, *Factory Certified Pre-owned Vehicle! *, *Heated Front Leather Seats*, *Moonroof*, *Navigation*, *Panoramic Moonroof*, *Premium Audio*, *Premium Stereo*, *Premium Wheels*, *Rear View Back-Up Camera*, Blind Spot Assist, COMAND® Navigation, COMAND® Single CD/DVD, KEYLESS GO®, Multimedia Package, Navigation Map Updates Included for 3 Years, Premium Package, SiriusXM Satellite Radio, Touchpad. Certified. Odometer is 2747 miles below market average! 4MATIC®. Certified. Odometer is 7377 miles below market average! 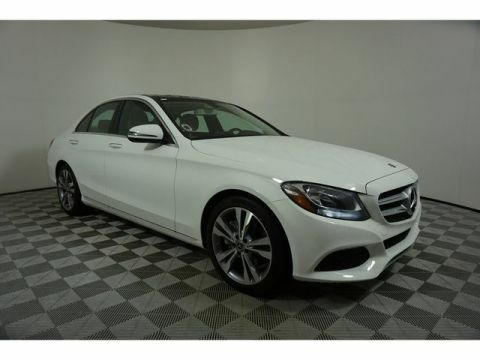 Please reach out: in case we missed a picture or a detail you would like to see of this 2018 C-Class, we are happy to send you A PERSONAL VIDEO walking around the vehicle focusing on the closest details that are important to you. We can send it directly to you via text, email , or Facebook messenger. We look forward to hearing from you! Mercedes-Benz Certified Pre-Owned Details: * Transferable Warranty * 165 Point Inspection * Vehicle History * Warranty Deductible: $0 * Roadside Assistance * Limited Warranty: 12 Month/Unlimited Mile beginning after new car warranty expires or from certified purchase date * Includes Trip Interruption Reimbursement and 7 days/500 miles Exchange Privilege **While we make every effort to verify options; occasionally human error may occur. ** Mercedes-Benz Certified Pre-Owned means you get an additional 12 months Limited Warranty on top of the existing factory warranty, with unlimited mileage. We also do up to a 162-point rigorous inspection/reconditioning, 24/7 roadside assistance, trip-interruption services, and a complete CARFAX vehicle history report. Comes with 12 Month/Unlimited Mile warranty + Trip Interruption Reimbursement and 7 days/500 miles Exchange Privilege4MATIC®. Certified. Odometer is 7377 miles below market average! *Blind Spot Technology - Never Worry When Changing Lanes Again*, *Bluetooth® Hands-Free Calling*, *Factory Certified Pre-owned Vehicle! *, *Heated Front Leather Seats*, *Moonroof*, *Navigation*, *Power Folding Mirrors*, *Premium Audio*, *Premium Stereo*, *Premium Wheels*, *Push Button Start*, *Rear View Back-Up Camera*, C 300 4MATIC®®, 4D Sedan, 4MATIC®®, AMG® Line, AMG® Line Exterior, AMG® Line Interior, AMG® Body Styling, Android Auto, Apple CarPlay, Black Fabric Headliner, Blind Spot Assist, Brushed Aluminum Pedals w/Rubber Studs, Flat Bottom Sport Steering Wheel, Front Brakes w/Perforated Discs, KEYLESS GO®, Navigation System, Panic alarm, Premium Package, Rear Spoiler, Security system, SiriusXM Satellite Radio, Smartphone Integration, Smartphone Integration Package, Sport Suspension w/Sport Steering System. Certified. Odometer is 3075 miles below market average! Please reach out: in case we missed a picture or a detail you would like to see of this 2018 C-Class, we are happy to send you A PERSONAL VIDEO walking around the vehicle focusing on the closest details that are important to you. We can send it directly to you via text, email , or Facebook messenger. We look forward to hearing from you! Mercedes-Benz Certified Pre-Owned Details: * Limited Warranty: 12 Month/Unlimited Mile beginning after new car warranty expires or from certified purchase date * Roadside Assistance * 165 Point Inspection * Vehicle History * Transferable Warranty * Warranty Deductible: $0 * Includes Trip Interruption Reimbursement and 7 days/500 miles Exchange Privilege **While we make every effort to verify options; occasionally human error may occur. ** Mercedes-Benz Certified Pre-Owned means you get an additional 12 months Limited Warranty on top of the existing factory warranty, with unlimited mileage. We also do up to a 162-point rigorous inspection/reconditioning, 24/7 roadside assistance, trip-interruption services, and a complete CARFAX vehicle history report. Comes with 12 Month/Unlimited Mile warranty + Trip Interruption Reimbursement and 7 days/500 miles Exchange Privilege*Blind Spot Technology - Never Worry When Changing Lanes Again*, *Bluetooth® Hands-Free Calling*, *Factory Certified Pre-owned Vehicle! *, *Heated Front Leather Seats*, *Moonroof*, *Navigation*, *Power Folding Mirrors*, *Premium Audio*, *Premium Stereo*, *Premium Wheels*, *Push Button Start*, *Rear View Back-Up Camera*, C 300 4MATIC®®, 4D Sedan, 4MATIC®®, AMG® Line, AMG® Line Exterior, AMG® Line Interior, AMG® Body Styling, Android Auto, Apple CarPlay, Black Fabric Headliner, Blind Spot Assist, Brushed Aluminum Pedals w/Rubber Studs, Flat Bottom Sport Steering Wheel, Front Brakes w/Perforated Discs, KEYLESS GO®, Navigation System, Panic alarm, Premium Package, Rear Spoiler, Security system, SiriusXM Satellite Radio, Smartphone Integration, Smartphone Integration Package, Sport Suspension w/Sport Steering System. Certified. Odometer is 3075 miles below market average! *Blind Spot Technology - Never Worry When Changing Lanes Again*, *Bluetooth® Hands-Free Calling*, *Factory Certified Pre-owned Vehicle! 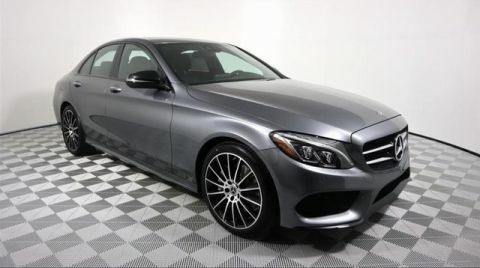 *, *Heated Front Leather Seats*, *Moonroof*, *Navigation*, *Panoramic Moonroof*, *Power Folding Mirrors*, *Power Windows, Locks and Mirrors*, AMG® Line, AMG® Line Interior, AMG® Line Exterior, AMG® Body Styling, Android Auto, Apple CarPlay, Black Fabric Headliner, Blind Spot Assist, Brushed Aluminum Pedals w/Rubber Studs, Electronic Trunk Closer, Flat Bottom Sport Steering Wheel, Front Brakes w/Perforated Discs, HANDS-FREE ACCESS, Hands-Free Access Package, HANDS-FREE Comfort Package, KEYLESS GO®, Premium Package, Rear Spoiler, SiriusXM Satellite Radio, Smartphone Integration, Smartphone Integration Package, Sport Suspension w/Sport Steering System. Certified. Odometer is 3182 miles below market average! 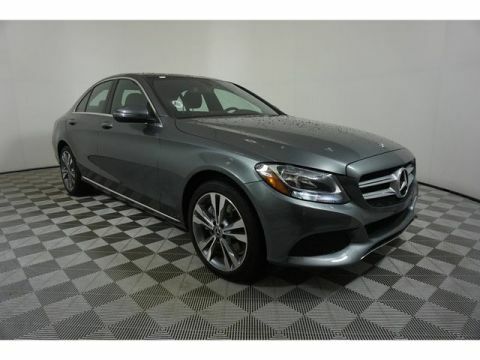 Please reach out: in case we missed a picture or a detail you would like to see of this 2018 C-Class, we are happy to send you A PERSONAL VIDEO walking around the vehicle focusing on the closest details that are important to you. We can send it directly to you via text, email , or Facebook messenger. We look forward to hearing from you! Mercedes-Benz Certified Pre-Owned Details: * Includes Trip Interruption Reimbursement and 7 days/500 miles Exchange Privilege * Transferable Warranty * Vehicle History * 165 Point Inspection * Warranty Deductible: $0 * Roadside Assistance * Limited Warranty: 12 Month/Unlimited Mile beginning after new car warranty expires or from certified purchase date **While we make every effort to verify options; occasionally human error may occur. ** Mercedes-Benz Certified Pre-Owned means you get an additional 12 months Limited Warranty on top of the existing factory warranty, with unlimited mileage. We also do up to a 162-point rigorous inspection/reconditioning, 24/7 roadside assistance, trip-interruption services, and a complete CARFAX vehicle history report. Comes with 12 Month/Unlimited Mile warranty + Trip Interruption Reimbursement and 7 days/500 miles Exchange Privilege*Blind Spot Technology - Never Worry When Changing Lanes Again*, *Bluetooth® Hands-Free Calling*, *Factory Certified Pre-owned Vehicle! 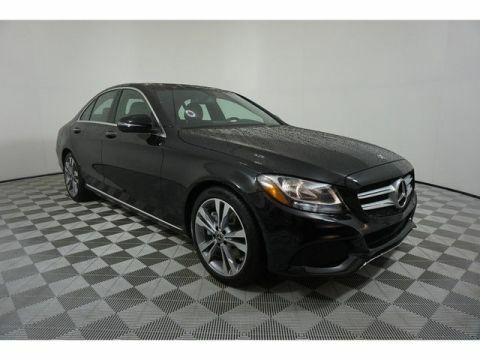 *, *Heated Front Leather Seats*, *Moonroof*, *Navigation*, *Panoramic Moonroof*, *Power Folding Mirrors*, *Power Windows, Locks and Mirrors*, AMG® Line, AMG® Line Interior, AMG® Line Exterior, AMG® Body Styling, Android Auto, Apple CarPlay, Black Fabric Headliner, Blind Spot Assist, Brushed Aluminum Pedals w/Rubber Studs, Electronic Trunk Closer, Flat Bottom Sport Steering Wheel, Front Brakes w/Perforated Discs, HANDS-FREE ACCESS, Hands-Free Access Package, HANDS-FREE Comfort Package, KEYLESS GO®, Premium Package, Rear Spoiler, SiriusXM Satellite Radio, Smartphone Integration, Smartphone Integration Package, Sport Suspension w/Sport Steering System. Certified. Odometer is 3182 miles below market average! *Blind Spot Technology - Never Worry When Changing Lanes Again*, *Bluetooth® Hands-Free Calling*, *Factory Certified Pre-owned Vehicle! *, *Heated Front Leather Seats*, *Moonroof*, *Navigation*, *Panoramic Moonroof*, *Premium Audio*, *Premium Stereo*, *Premium Wheels*, *Rear View Back-Up Camera*, Active LED Headlamps, Adaptive Highbeam Assist, Advanced Lighting Package, Ambient Lighting, AMG® Line, AMG® Line Interior, AMG® Line Exterior, AMG® Body Styling, Android Auto, Apple CarPlay, Black Fabric Headliner, Blind Spot Assist, Brushed Aluminum Pedals w/Rubber Studs, Flat Bottom Sport Steering Wheel, Front Brakes w/Perforated Discs, Illuminated Door Sills, KEYLESS GO®, Night Package, Night Package (P55), Premium Package, Rear Spoiler, SiriusXM Satellite Radio, Smartphone Integration, Smartphone Integration Package, Sport Suspension w/Sport Steering System. Certified. Odometer is 2120 miles below market average! 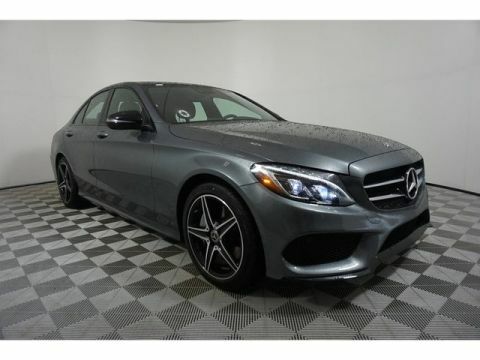 Please reach out: in case we missed a picture or a detail you would like to see of this 2018 C-Class, we are happy to send you A PERSONAL VIDEO walking around the vehicle focusing on the closest details that are important to you. We can send it directly to you via text, email , or Facebook messenger. We look forward to hearing from you! Mercedes-Benz Certified Pre-Owned Details: * 165 Point Inspection * Roadside Assistance * Includes Trip Interruption Reimbursement and 7 days/500 miles Exchange Privilege * Limited Warranty: 12 Month/Unlimited Mile beginning after new car warranty expires or from certified purchase date * Warranty Deductible: $0 * Transferable Warranty * Vehicle History **While we make every effort to verify options; occasionally human error may occur. ** Mercedes-Benz Certified Pre-Owned means you get an additional 12 months Limited Warranty on top of the existing factory warranty, with unlimited mileage. We also do up to a 162-point rigorous inspection/reconditioning, 24/7 roadside assistance, trip-interruption services, and a complete CARFAX vehicle history report. Comes with 12 Month/Unlimited Mile warranty + Trip Interruption Reimbursement and 7 days/500 miles Exchange Privilege*Blind Spot Technology - Never Worry When Changing Lanes Again*, *Bluetooth® Hands-Free Calling*, *Factory Certified Pre-owned Vehicle! *, *Heated Front Leather Seats*, *Moonroof*, *Navigation*, *Panoramic Moonroof*, *Premium Audio*, *Premium Stereo*, *Premium Wheels*, *Rear View Back-Up Camera*, Active LED Headlamps, Adaptive Highbeam Assist, Advanced Lighting Package, Ambient Lighting, AMG® Line, AMG® Line Interior, AMG® Line Exterior, AMG® Body Styling, Android Auto, Apple CarPlay, Black Fabric Headliner, Blind Spot Assist, Brushed Aluminum Pedals w/Rubber Studs, Flat Bottom Sport Steering Wheel, Front Brakes w/Perforated Discs, Illuminated Door Sills, KEYLESS GO®, Night Package, Night Package (P55), Premium Package, Rear Spoiler, SiriusXM Satellite Radio, Smartphone Integration, Smartphone Integration Package, Sport Suspension w/Sport Steering System. Certified. Odometer is 2120 miles below market average!